How does the urine anion gap calculator work? What is a normal urine anion gap? This calculator helps you estimate the urine anion gap based on sodium (Na⁺), potassium (K⁺), and chloride (Cl⁻) levels measured in urine. Read on to learn what is a normal urine anion gap. 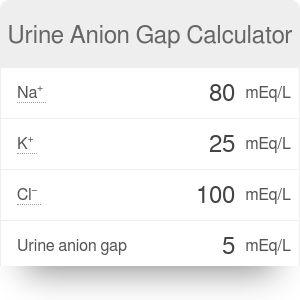 Please note that this calculator estimates the urine anion gap. For serum anion gap based on anions found in blood serum, check out our anion gap calculator. If this is helpful to you, you might like our GFR calculator or corrected calcium calculator. A positive urine AG suggests a low urinary NH₄⁺ (renal tubular acidosis). A negative urine AG suggests a high urinary NH₄⁺ (diarrhea). Urine Anion Gap Calculator can be embedded on your website to enrich the content you wrote and make it easier for your visitors to understand your message.